During our last trip to Italy to photograph a wedding in Lake Como (post coming soon! ), we had the pleasure of having our pictures taken by a wonderful human being and professional, Suzy Curtis. She and her hubby Patrick traveled with us through Italy. We had an incredible time with them, from eating some of the best Italian food I've ever had, to shopping, to documenting everything with our cameras. 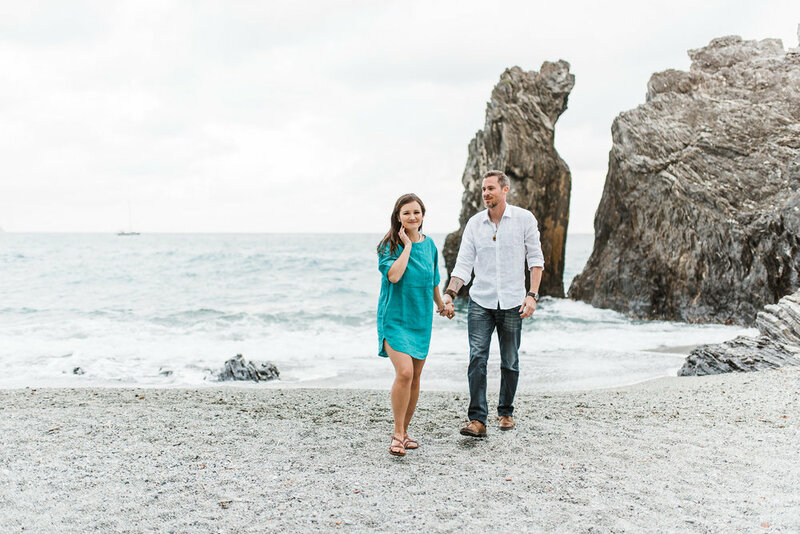 While in Cinque Terre, we decided to do some couple shoots of each other. Kev and I went shopping earlier in the day and bought some beautiful Italian linen clothes and some other gorgeous pieces from local shops. Kevin surprised me with a freshwater pearl necklace he picked up at a jewelry shop that has been in business for over a hundred years. It is so lovely, with a hand-crafted silver clasp and beautifully irregular pearls. We had a wonderful time shooting on the beach. It was a perfect night, with soft lighting and a calm sea. It isn't often that Kev and I have the camera pointed on us (in fact, we only ever had a photoshoot with us one time and our photographer lost the images when his computer crashed). We were nervous but Suzy has a comforting and calm manner that helped us feel not only at ease but also romantic and loving with one another. An altogether perfect experience. And we love the finished photos! They are more than we hoped for, every one intimate and sweet, with some beautiful close-ups as well as larger landscapes. I can't wait to enlarge some of these for our walls. Read Suzy's original post here (it is SO sweet!) and enjoy looking through our images!